Here are three albums that have illuminated my year so far in diverse ways. They share a few common traits. These are geographical, all hail from Scotland, a sense of adventurousness and a distinctive sense of being outsiders in that they sound nothing like any of their contemporaries or even one another. These albums by St Jude’s Infirmary, My Latest Novel and Viva Stereo retain the mantle of the outsider but wear it proudly and proclaim it jubilantly. Each band has enchanted, haunted and moved me in ways that few others have of late. They seem to have developed in isolation but embrace pop from differing angles. They are pop. Pop that charms, chills and insinuates, rather than bludgeons itself into your consciousness. Pop that strives for perfection without losing its focus, bite or power. Pop that makes you fall head over heels in love again in an effortless fashion that leaves me breathless, wondering how it happened but elated that it did. Three bands, three albums, an infinite world of possibilities contained within them. Saint Jude’s Infirmary have been around in one form or another for around a decade, gigging sporadically, recording demos and much as I’d loved them I thought they were doomed to being one of those bands who were constantly overlooked. Departing Edinburgh for Utrecht then returning to the capital seems to have focussed their minds sufficiently that they released their debut album Happy Healthy Lucky Month on SL Recordings in January to no little critical acclaim. Was it worth the wait? Damn right it was. St Jude, so aptly named after the patron saint of lost causes, have produced a perfect album, all beauty and rawness. The best way to describe this album is to say that it begins with a prayer, the beautiful ‘The Church Of John Coltrane’, and ends in a riot, the rambunctious, fiery ‘Vvvampyres’. In between, there are songs about saints, the firebombing of Dresden and the actress Jean Seberg, most famous for playing Joan of Arc in Otto Preminger’s 1957 film Maid Of Orleans. Latterly, Seberg was hounded to suicide by the C.I.A. over her support for the Black Panther Movement. It’s a beautifully haunting song; Joan of Arc relocated to Scotland, love as an act of martyrdom with heartbreakingly simple lines such as ‘I would have followed you from the light to the dark to be at your side’. Religious imagery pervades through the song’s lyrics, there’s a hymnal feel to some of it but it’s a determinedly secular record. The theme of love; love between people, of music, of times and places, runs through Happy Healthy Lucky Month. From ‘The Church Of John Coltrane’ with its spectral organ and sparse drums prominently foregrounding a delicately uplifting, almost reverential vocal singing lines like ‘When we kiss / it’s not with lust / or with hormones /But a salute between old partisans’, to ‘Montreal’ a sweet hymn to the city. Historical figures, songs, events and places are invoked contributing to the strange world that Saint Jude creates for themselves out of disparate sources and influences. ‘Good-bye Jack Vettrainno’ is heavenly, invoking Kirkcaldy’s most famous son (it’s the hometown of St Jude’s) with a rough, deep and warm male vocal and heavenly female backing. It’s a tale of loss and regret, pulling no punches as the protagonist admits to knowing everything about his body, from his liver that takes ‘another lucky punch’ but does not know his heart. It’s a bruised, elegant epic, full of warmth and pathos. Often St Jude’s Infirmary sound as though the songs will collapse around them, there’s fragility to this album that just adds to the gorgeousness of it. Guitars, bass and drums are augmented with cello, keyboards, melodica and an everything- but-the-kitchen-sink approach is attempted, though with subtlety and skill, leaving the songs and arrangements room to breath. ‘All My Rowdy Friends’ is the sound of a band falling drunkenly down a flight of stairs. Along with ‘Vvvampyre’, it’s the noisiest thing on an album of varying moods. As the chorus says, ‘It’s all very sweet in a Jim Carroll kinda way’. I keep coming back to this album, it’s luscious. It drops in millions of influences, moods and resonances and sounds like everything good in music over the last four decades and hugely original. It’s accompanied me at all hours of the day, from 7 a.m. winter Sundays staggering home from work to blocking out shopping mall muzak. It’s a lean album, no excess flesh or deadwood, simple but breathtakingly ingenious. Raw, precise and fragile, bits that might sound like mistakes on lesser records add to the charm of it. A truly ambitious album, a thing of rare beauty. My Latest Novel hail from Greenock. I’d seen the name being touted about a few times but thought it was terrible. Very knowing, very post-modern and slightly smug. Then I heard them and had to retract all my preconceived notions within less than a minute. 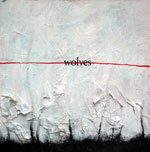 Wolves is an epic piece of work, hugely engaging and imaginative. Like St Jude’s Infirmary, they use the pop song only as a frame to hang their own ideas upon, stretching and distorting them into something new. The first song ‘Ghost In The Gutter’ builds up out of almost nothing, just a sparse guitar motif before exploding into an incredible instrumental passage that reminds me a lot of that first Godspeed You Black Emperor album, the truly good one with ‘Dead Flag Blues’ on it. It moves with ease from passage to passage, instruments and volume dropping in and out. There’s more ambition in this opening song than many bands achieve over an album and it leaves me exhilarated, breathless and enraptured. Greenock appears to have allowed the band to develop in isolation, their sound is equally expansive and claustrophobic, difficult yet catchy as hell. At times My Latest Novel are almost overwhelming in intensity, at other points the sound is sparse. At all times they sound slightly otherworldly as if they inhabit another time and place. Tracks such as ‘Pretty In A Panic’, the luscious ‘The Hope Edition’ and ‘Wrongfully I Rested’ sound folky, in a haunting, mournful way. The two singles, ‘Sister Sneaker Sister Soul’ and ‘The Reputation Of Ross Francis’ (which for a while I thought was Francis Rossi and had some weird image of the erstwhile Status Quo member busking in the streets of Greenock) are excellent. The former is an elegant love song, all soaring violin and uplifting vocals. The latter tells the tale of Ross Francis, a prophet without a flock, ‘our effervescent friend’ pleading his case at the gates of heaven: ‘If you give me a chance to explain/I’ll show my life wasn’t in vain’. Both are pop songs at their best, catchy as hell, but with plenty of odd twists and turns, much like the rest of Wolves really. As with St Jude’s Infirmary there is a hell of a lot going on in here, much of which isn’t obvious on just a couple of casual listens. Both albums go well beyond the simple musical and lyrical limits of most of their contemporaries to explore a rich vein of music that, while definitely having precedents, sounds original and unique. Both albums feature some exceptional song writing and a beautiful interplay between male and female vocals, which leave me gasping for breath. 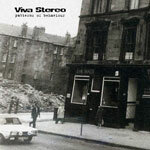 Viva Stereo are probably Glasgow’s best-kept secret. Patterns Of Behaviour is their second album on their own miniscule Much Better Records via Fence. The cover is of a familiar yet unrecognisable scene, The Halt Bar on Glasgow’s Woodlands Road. The grainy black and white picture, the car and clothes of the people passing by date it to the late 60s/early 70s, yet the pub itself is still the same. The sound here is less organic but equally inventive. There is a much heavier focus on electronic instrumentation in the Viva Stereo camp and many of the songs fall into a more pop format though again it’s a challenging form of pop. Opening song, ‘Lost in A Field’ insinuates itself into your psyche with its repetitive bass-line, simple acoustic guitar and Spartan drum pattern providing the background for some beautiful trumpet playing. It’s very atmospheric, haunting and pretty. Oh I know it’s a cliché but it does sound like the soundtrack to a film never made, perhaps a prequel to The Wicker Man. Later on in, ‘Gone’ treads similar ground. It’s an imaginative, elegiac instrumental with a vaguely Eastern European spy film soundtrack feel, reminiscent of that exceptional first Portishead album, Dummy. ‘Ridden’ really stands out with it’s wasp in a vocal booth electronics and raw, forlorn vocal high in the mix lamenting a relationship that has gone badly awry: ‘There’s three of us in the end/Or was it four?’ Other songs adopt a more full on electronic approach, the darkly disturbing ‘Syntax Errors’ sounds frightened and frightening at the same time. ‘Patterns Of Behaviour’ features a lovely duet with the theme of communication breakdown being developed as a motif for much of the album with the accusations thrown between the male and female vocalists: ‘Why don’t you say what you mean for a change? / Why don’t you mean what you say for a change?’ before the song bursts into some edgy punk-funk guitars like a warped ‘Wrote For Luck’ and the repeated refrain of ‘Good times are all we ever want/Bad times are never far behind’. ‘You’re Not Committed To The Company’ is an excellently sardonic swipe at the world of 9-5 employment while the final tracks, ‘The Orange Room’ and ‘Take Me To The Bridge’ are more downbeat, almost mournful. Patterns Of Behaviour is a breath of fresh air for those of us who hoped that electronic based pop music could be more than just a blast of early '80s nostalgia. Each of these albums is remarkably different from the other, you couldn’t attempt to lump them together as part of some spurious movement. Over an album each band has created a world of their own out of disparate sources, worlds, which draw you in completely.